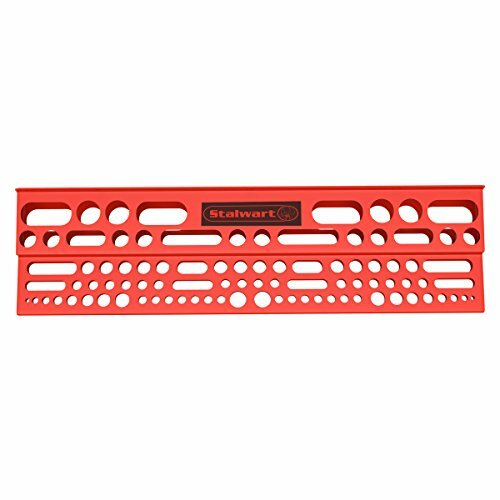 The Tool Storage Bar by Stalwart is an excellent organizational solution for your garage, shed, or work shop. Constructed from strong and durable polypropylene, this storage rack is made to last and helps keep your tools optimally organized. The rack is mountable and is simple to install on a pegboard or wall to help make your most important tools easy to find when you need them. The tiered bar also features 96 holes for a wide assortment of tools like pliers, screwdrivers, wrenches and more! IMPACT RESISTANT MATERIAL- Constructed from strong and durable polypropylene, this 2-level storage rack is difficult to damage or break. It is also rust proof and made to last. MOUNTABLE- The storage bar is conveniently mountable on a wall or pegboard. Mounting your tool storage shelving unit helps to keep your most important tools organized and within reach when you need them. HOLDS UP TO 96 TOOLS- With 96 various sized slots, this organizer is ideal for a wide assortment of hand tools or automotive tools. It is great for screwdrivers, wrenches, pliers, and more and eliminates the need to search through messy tool boxes. VERSATILE USE-This tool shelf is the perfect organizational solution to keep tools and hardware neatly stored and tidy. It can easily be used in a garage, shed, work shop, or above a workbench. PRODUCT DETAILS- Material: Polypropylene Plastic. Dimensions: Length 24 1/64" x Width 6 1/32" x Height 2 3/4". 96 holes for storage.